After his death on 15 January 1909 Arnold Janssen was laid to rest in the chapel in the cemetery of St. Michael's Mission House (see photo overleaf). Since his beatification by Pope Paul VI in 1975 his embalmed body rests in the present tomb in the lower church of St. Michael's. The tomb is a gift from the people of Steyl and Tegelen. It was designed by Will Horsten, an artist from Kevelaer. Arnold Janssen was canonized by Pope John Paul II on 5 October 2003 in Rome. The pillars of Saint Arnold Janssen’s spirituality are depicted in relief on the sides of his tomb. The tomb stands on three legs with a plant growing from each one, symbolizing the three religious congregations that Arnold Janssen founded. The plant on the front may also recall the burning bush, through which God spoke to Moses. 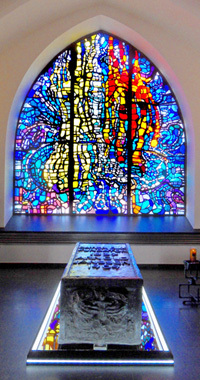 The bright colours in the window behind the tomb depict a favourite theme of Arnold Janssen: “May the darkness of sin and the night of unbelief vanish before the light of the Word and the Spirit of grace.” Glass stones held together by resin symbolize the hands of God that reach out to creation: the yellow hand of Light and the red hand of the Spirit. The whole cosmos is filled with the light and the life of God.